I’m not talking about things like the dining room being the wrong colour or changing the tiles in the bathroom but fundamental issues like heat loss, damp, sound travel from neighbouring properties, lighting requirements or structural changes – the things which can change the whole liveability of your home and the things which must be factored in from the offset of works. In terms of sound, which this blog post is focusing on, you may end up with a newly, wonderfully decorated home, but if you can still hear the neighbours kids screaming at each other or the opening bars of Eastenders as they settle down to an evening’s telly, you may never truly be happy with your finished project. A major issue here has indeed been sound travel between ours and the neighbouring property, due primarily to the fact that there’s only a single skin of brickwork to the original mid-1800’s section of the property and a wall not much thicker to the part built in the early 1900’s. 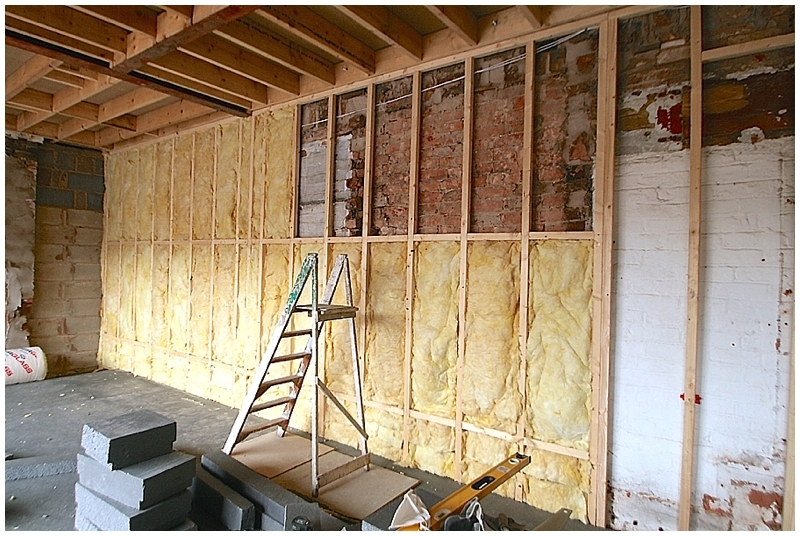 To future proof our home and try to ensure minimisation of sound travel, we’ve specified that a stud wall be build off the brickwork and this week have thoroughly insulated with an acoustic product behind and between the timber. 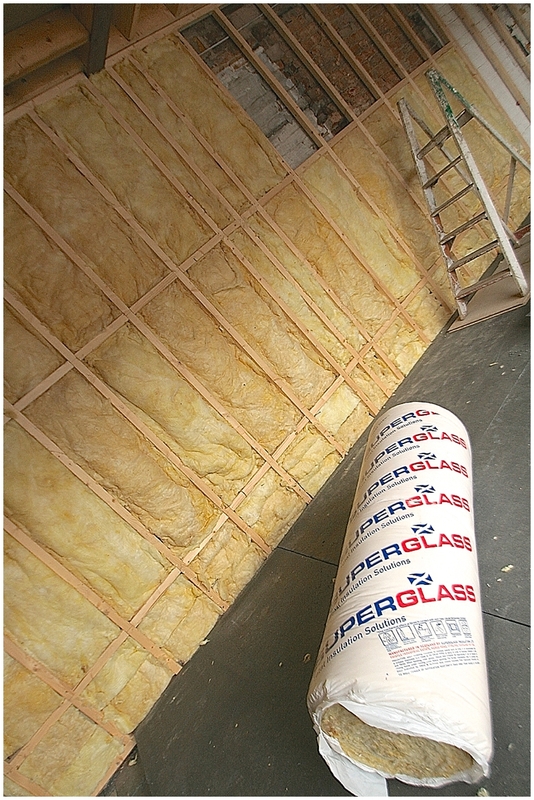 After much research, I chose SuperGlass’s 50mm Acoustic Insulation Roll, a lightweight, non-combustible, glass wool roll designed for use in metal or timber stud exactly like ours. Each of the 50mm thick rolls is 13m long and does approx 15msq. Our extension is 9m long and has two floors at approx 5m in height total, so we got 5 rolls. It cuts very easily with scissors and I found it extremely easy to use, with gloves and a mask, as it’s a bit scratchy on the skin. On the ground floor this party wall will be the main kitchen wall so must be strong enough to hang units on. The timber frame means there’s a gap in front of the already shoddy brickwork so simple plasterboard screwed to the timber frame won’t be strong enough. We’re securely fixing 18mm plywood to the front of the frame for rigidity and to give any fixings something solid to fix into, then we’ll plasterboard over the plywood. 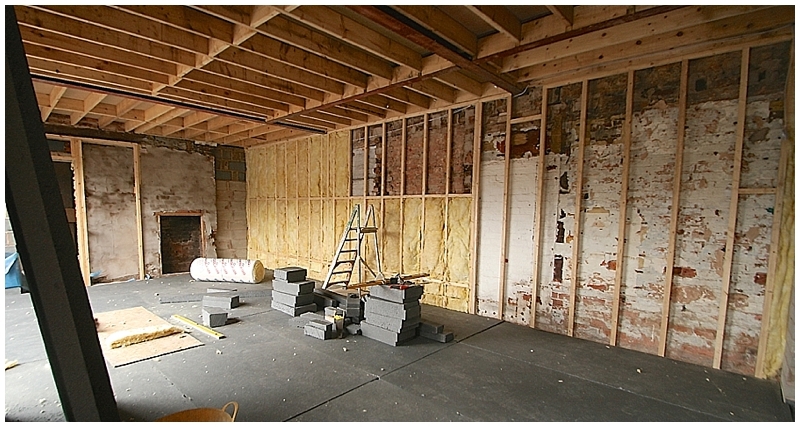 On the first floor we’ll be using a 12mm plasterboard with no plywood behind as there are no units etc to hang. Someone suggested double boarding for extra sound protection even on top of the acoustic roll, but i think we’ll get a single layer on and do a sound test with the neighbours first. NB: In line with our policy of buying our own stuff at the best prices, I tried to buy this product direct from the manufacturer. In exchange for installation images and an honest review (to be done after the plaster boarding is complete), they sent me the rolls I needed for this project without charge which was very generous of them. That won’t affect my review. If I can still hear the neighbours, or vice versa, i will be saying so. I look forward to reporting back when we’ve done some practical tests but I must say, since putting it in, I haven’t heard a peep from next door’s myriad of musical instruments. I think it might be working already, even before the plywood and plasterboard is fitted.